The Chronicle got an early look at the building and although a lot of construction work remains, it is already possible to imagine the finished version. 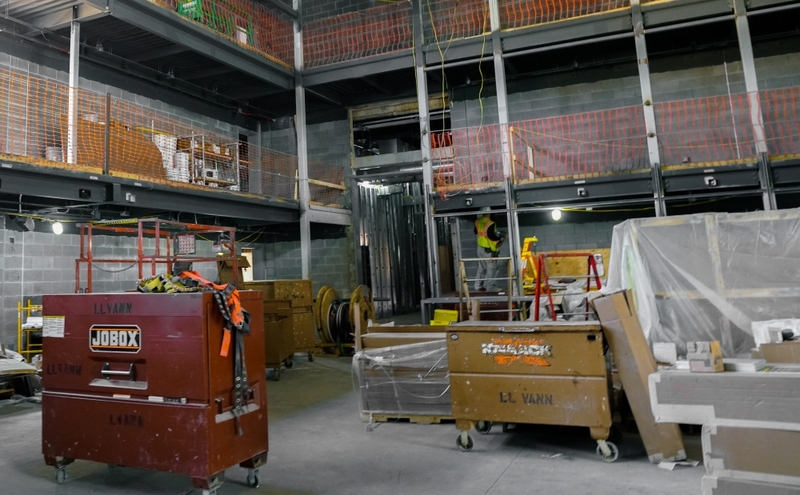 As we toured the facility with Christopher Roby, assistant vice president for student affairs, and Scott Lindroth, vice provost for the arts, it became evident that the space will become a key part of the campus arts scene. 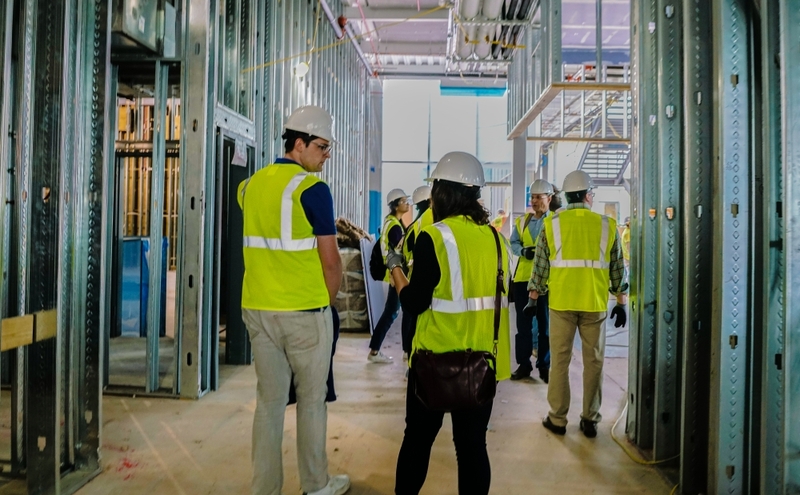 We began our tour at the front of the building—donning hardhats, neon green vests and gloves before being escorted inside. Upon entering the atrium, we were immediately shown a flexible multipurpose room that Lindroth said would host a variety of meetings, events and speakers. 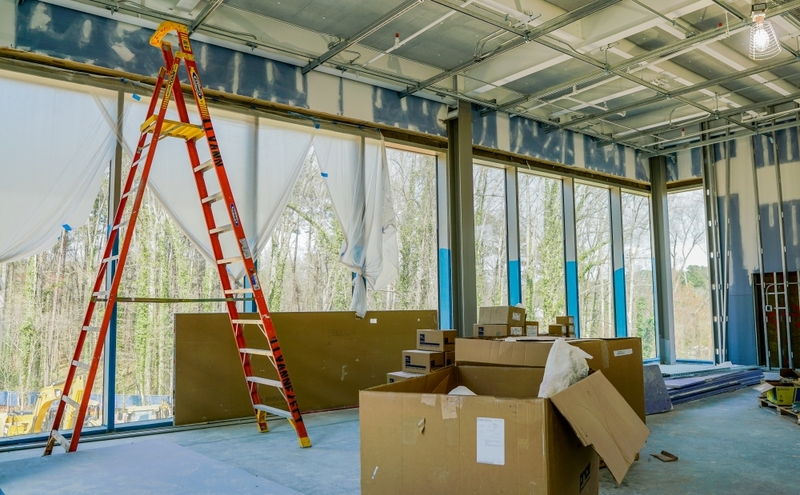 WXDU, Duke’s student-run radio station, is getting a major facilities upgrade and will have its broadcast studio on the first floor as well. Roby said the new facility may give the station a different vibe than its current location in the Bivins Building on East Campus. Large glass windows will open the studio to the rest of campus, he said. We left the corner office and turned toward the center of the building, where Lindroth and Roby seemed excited to show off the main theater. The theater will seat more than 200 people and is set up to be easily reconfigured for a variety of different productions. Lindroth envisions the space being useful for theater and dance groups, but emphasized that it was designed to be an “immersive media setting.” He also said the space could be a useful tool for offering theater tech workshops through the DukeCreate program—an arts workshop series. Dressing rooms and storage facilities are available in the back. The theater’s doors are on the side and will be soundproof so the building can host multiple large events at once. Across the hall from the theater is a dance studio—Lindroth said that student dance groups have faced increasing demand for space in recent years—and administrative offices for the arts staff. Like other places on campus, the center will provide cameras and other digital equipment for students to check out. Next, we took a look into the center’s nearby second theater—designed to focus on film screenings. The theater, which will seat approximately 100 people, will have five projectors in total to show archival and modern footage. Lindroth said the space could support a visiting filmmaker. Duke is contracting with a specialist in Chicago—James Bond—to refurbish a 35 mm projector, the two tour guides said. Around the corner from the theater are several large workspaces. The rooms will come equipped with lighting racks and audio-visual equipment that “arts projects teams” can reserve for rehearsal or creative space. He said the designers tried to strike a balance between creating flexible-use spaces and ensuring that they also have the specific functionalities necessary for students to use them. At the rear of the building, we visited a "makerspace," similar to the Innovation Co-Lab on West Campus in its equipment and capabilities. For example, the space will have a three-dimensional printer and other mechanical equipment. Two large bay doors open into an outdoor courtyard that will be used for art space as well. We turned back down the hallway and headed upstairs, where we saw a painting studio—with north-facing windows that are good for painting—and a room for critiquing. 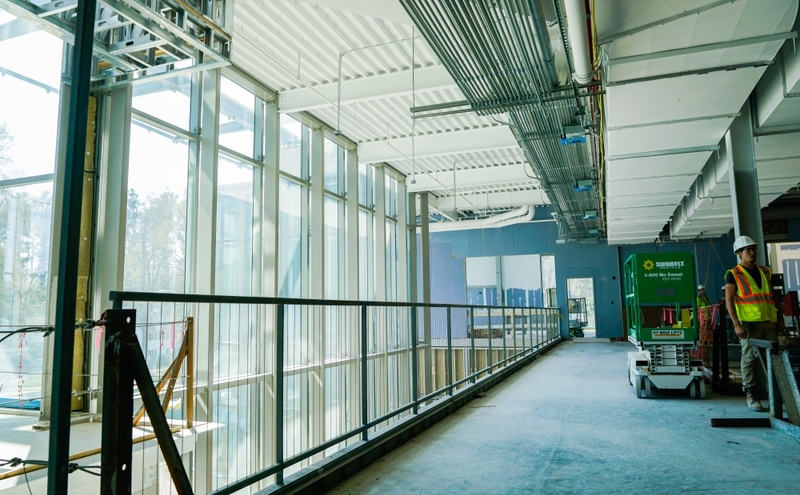 The second floor will also be home to the arts of the moving image and dance departments. Offices, a classroom, digital editing space and a light-controlled studio will all be available for AMI in the new building. “That program does pretty well in attracting students, but we hope this will amp that up even more,” Lindroth said. The dance department will be consolidated from its current studios on Hull Avenue, the Ark Dance Studio and Bivins. The American Dance Festival will also make use of the facility, Lindroth said. Alongside the dance studios upstairs are showers and locker rooms. And for those curious about the large glass box hanging off the second floor, that is a massive dance studio as well. Glass features prominently in the facility’s architecture. That was intentional, Lindroth and Roby said. It is supposed to match the style of the Nasher Museum of Art's concrete panel walls across the street, but to also allow greater openness. “Here’s my advice, open up a window washing company in Durham,” Roby joked. The designers have already planned for this by installing a system on the roof to allow workers to repel down and clean the windows. On the whole, the facility marks an effort by the University to reemphasize and invest in its commitment to the arts. The DukeCreate program will be restructured as an umbrella organization to support arts programming through visiting artists and arts project teams, Lindroth said. The new space may also provide opportunities for students interested in entering careers in arts fields. 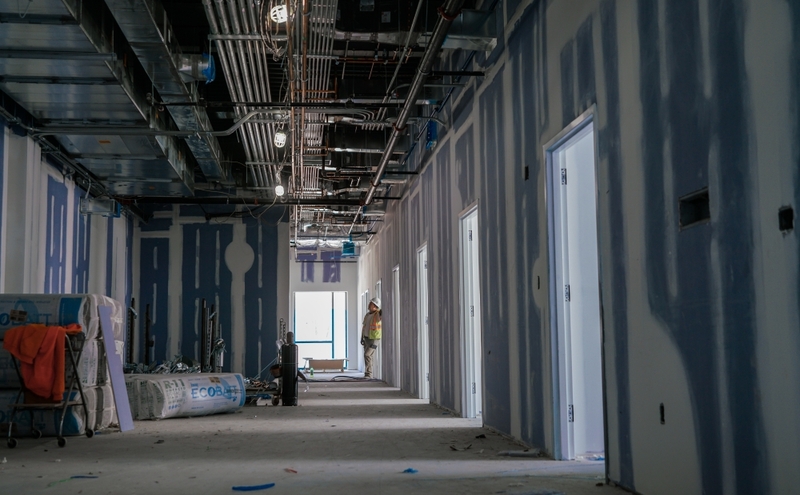 The building’s construction team says they plan to receive the Certificate of Occupancy between September and November, allowing the building’s users time to start moving into the new space before its January opening. So far, Lindroth said they University plans to hire 3.5 full-time equivalent staff members to oversee the facility. Additional graduate students will be hired as well. Walking out of the building, I pondered its contribution to Duke’s arts scene in the coming years. The $50 million building—on budget, according to Lindroth—will undoubtedly centralize the arts, although the Arts Annex and theater facilities in the Bryan Center will remain open. But beyond its status as an arts hub, the facility can serve as a “gateway” for new opportunities for scholarship and public engagement—as well as a venue for student window-washing entrepreneurship.